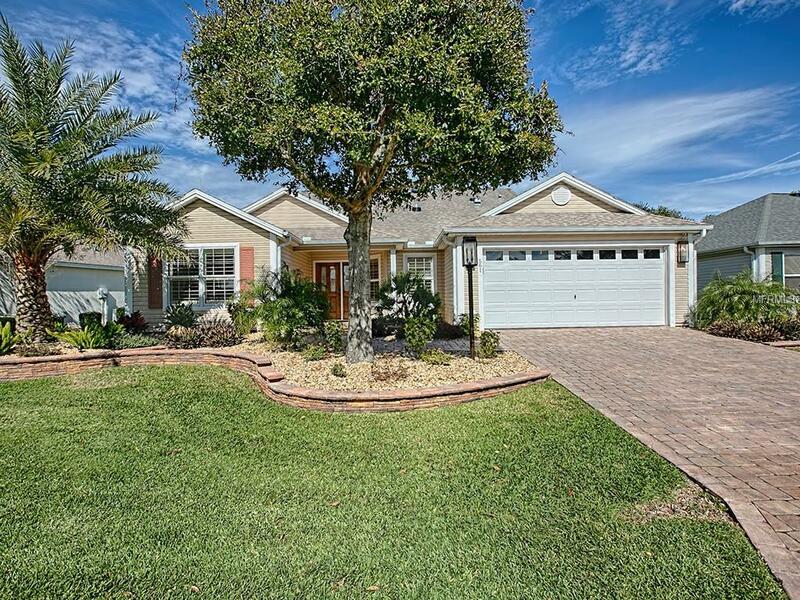 BOND PAID on this LOVELY CAMELLIA Designer (vinyl Gardenia) w/ GOLF COURSE & WATER VIEW in the convenient Village of BELVEDERE. All NEW LIGHTED landscaping w/stacked rock walls around the entire home! This home has been freshly painted throughout and the popcorn ceiling was replaced w/ knockdown texture! ALL of the flooring is NEW w/ DIAGONAL TILE (w/underlayment) everywhere except the bedrooms which are enhanced w/ LAMINATE! The all NEW upgraded kitchen has refurbished cabinets, 2018 BLACK STAINLESS APPLIANCES, GRANITE counters, GLASS back splash, new sink and LED can lights were added! The wall and column were removed into the dining area which creates easier access from the kitchen as well as a more open floor plan. Lovely lifetime PLANTATION SHUTTERS and custom light fixtures were added throughout the home! There are REMOTE CONTROLLED Hunter Douglas Luminette Sheers w/rotating vanes on the sliding glass doors out to the enclosed lanai! All NEW Granite counters and sinks in the en-suite Master bath and guest bath! The front guest room does not have a closet but a MURPHY BED and desk have been added for a guest room and/or office! The acrylic enclosed lanai w/remote controlled shades is a great space to enjoy the FABULOUS GOLF & WATER VIEW and all the wildlife it brings! NEW washer & dryer, 3 NEW solar tubes w/solar night lights, NEW 50 gallon WATER HEATER, NEW Alarm System, all NEW electrical switches, NEW custom lights outside, NEW gutters and the list goes on....GREAT LOCATION & A GREAT "NEW" HOME!